For this year's TWC, we partnered with two ski resorts for our giveaway - Steamboat (3-day trip for 2 plus rentals and lift tickets) and Killington (2-days of Winter access and 2-days of Summer access). As always, the hospitality of the Tuck team made us feel right at home. Read below for our recap! 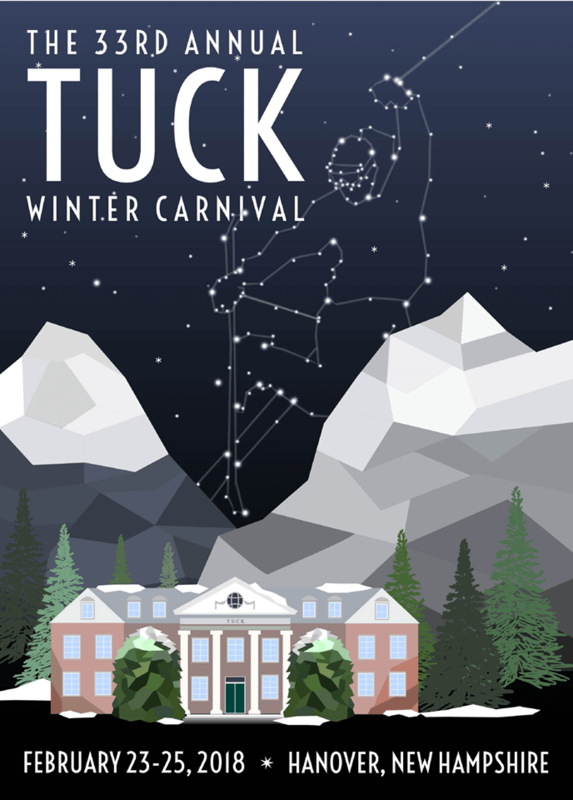 EVENT DESCRIPTION: "Tuck Winter Carnival is an annual extravaganza that brings MBA students from all over the nation to celebrate the winter season in Hanover, NH. 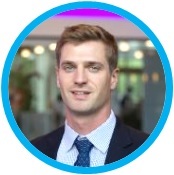 Unlike case competitions or recruiting fairs, this is a one-of-a-kind inter-collegiate event for MBAs with the sole purpose of enjoying the outdoors and making connections with other students." This year, registration took place in two locations due to the longest-standing conference at Tuck. We began in the legendary Cohen Hall, where the Tuck team greeted arrivals with games and plenty of s.w.ag. to build everyone’s stoke for the weekend. Typically, the Occum Pond Party is a simultaneous event that brings everyone together on the first day. However, due to unseasonably warm temperatures the week previous, the ice was in no condition to skate and the Tuck crew was forced to cancel the event- no matter, though, as attendees quickly made themselves at home on campus and skipped right ahead to party-mode. Around 4:30, we moved into Thayer Hall, a larger venue complete with the fashion show stage. Beer flowed and in addition to great costumes, we got to see firsthand the creativity and “punny” hilarity of each school’s event-specific attire. As everyone mingled, drank beer, and refueled with tasty snacks, the Tuck crew transitioned into the evening’s marquee event- the 80’s fashion show. From our vantage, we got the full experience of catwalk struts, choreographed dance moves, and the occasional audience member being pulled up to shake their stuff and aid in marketing that group’s attire. As things wound down in Thayer, the party only began to rev up. Upon the fashion show’s completion, willing attendees were whisked away to the Lebanon Airport for a raucous night of dancing- the perfect way to prepare for the next day’s athletic showcase: race day! In order to get the real sense of the day we were facing, we arrived at the Skiway early and already, the stoke and excitement in the air was palpable. After fueling up on donuts and coffee, the serious racers began taking their practice runs and adjusting to the spring-slush conditions that we were given. As racers began to filter into the venue, we were greeted with a veritable treasure trove of amazing costumes. From Darden’s colonial attire to the Tuck 4 Loko team to the Sloanies in full “Grease” garb, nothing disappointed. At noon (and after a countdown by all eager attendees in the beer tent) the Lagunitas began to flow and food was served. Some participants only nibbled as a way to prepare themselves for the legendary hot dog eating contest. Like last year, everyone was able to hold their dogs (at least as far as we could tell). After dinner (for all who wanted to attend), it was time to migrate once again to the Lebanon Airport for the event’s closing ceremonies. We were fortunate enough to be on stage to hand out the prizes to the winners of our giveaway (big congrats to Crosby Fish of Cornell for winning the Steamboat trip and to Marina Chiesa of Tuck and Tom Kellogg of Darden for taking home the second and third place prizes). Once the prizes were given out, it was time to get down to business. The amazing Tuck 80’s Cover Band played out the night with truly impressive covers. We don’t know what was more impressive, their onstage attire or the high harmonies and falsettos that are so often required in the 80’s pop genre. All in all, a picture perfect sendoff for an event that we are already counting down to for next year! Curious How the 2017 Tuck Winter Carnival Went? 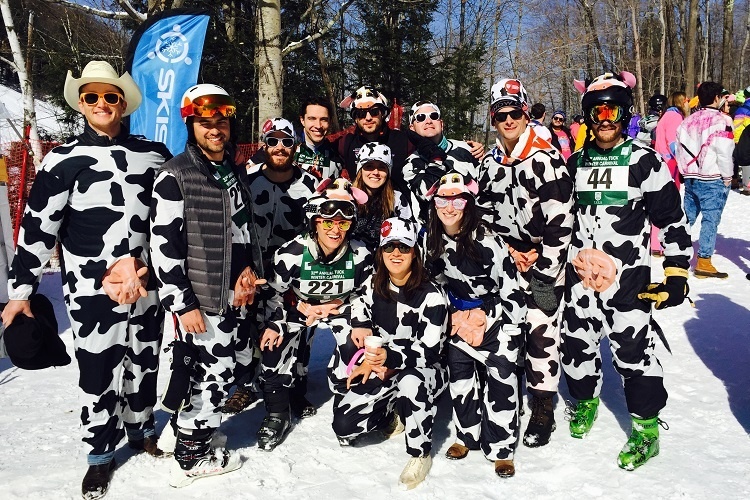 For 32 years now, hundreds of ski enthusiasts from some of the nation’s top MBA programs descend upon Hanover, NH to party at the Tuck Winter Carnival (TWC)…and do some good while they’re at it. It’s a solid weekend of fundraising, competition and the occasional hairy-legged MBA Candidate sporting daisy dukes and a Kentucky Waterfall (that’s a pro-level mullet, for you newbies). This was SkiSync’s second year as a sponsor and we were once again treated like family by the Tuck Winter Carnival attendees and Co-Chairs. This year, SkiSync also teamed up with our friends at Keystone Resort to give away a killer 4 day/3 night trip for 2 to Keystone, CO (more on this in the events section below). Anyway, if you’re a member or leader of the ski club for your MBA program, this review of the 2017 TWC is most definitely for you. 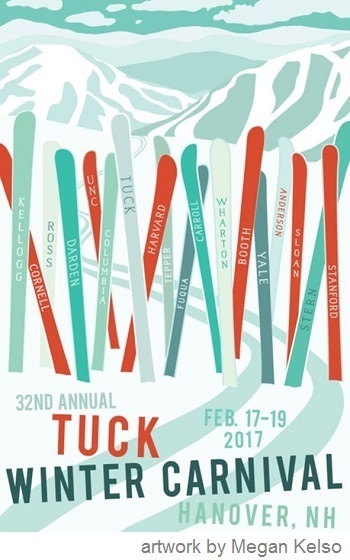 The Tuck Winter Carnival this year was comprised of 6 main events with a few smaller events densely packed into Friday and Saturday schedules. Having planned and managed hundreds of ski event registrations, I can tell you that this is typically one of the biggest sticking points for any event, especially those with hundreds of attendees. However, the registration in Raether Hall went very smoothly with no long lines, confusion or angry attendees. Everyone checked in and hopped right into the fun without a hitch. Great planning on part of the TWC Co-Chairs. Occurring simultaneously with registration was the Occum Pond Party. Occum Pond has a rich history at Dartmouth and proved to be an excellent setting for attendees to get in on some skating, sledding and a little pond hockey. Some people opted out of the activities (perhaps a little spent from their travel to the event) to just kick back and enjoy the coffee or hot chocolate that was provided on-site. Just after registration was happy hour, which included an 80’s ski gear sale and auction in which the proceeds benefited a local charity. There was a small stage behind the registration area, and from SkiSync’s nearby booth, I could see the gear sale/auction part of the event was run like a fashion show. There was some serious catwalk action going on and a couple horribly choreographed dances (but that’s what makes them great, right?). The whole show was hilarious but the bidding was serious stuff - definitely a fun and creative way to support a great cause. Now, I still have no idea how everyone managed to get their hands on so much ski gear from the 80’s, but it was everywhere. It was a veritable smorgasbord of geometric shapes and every "hot" color made. There was plenty of beer, high fives and lots of good vibes to go around. Saturday started with a full day of activities, starting with the Racers Breakfast sponsered by Dunkin Donuts. As you can imagine, there were plenty of doughnuts and gallons upon gallons of coffee. One thing I've learned about this area of the U.S. is that you can't escape Dunkin Donuts...they're everywhere. Fortunately, it's pretty tasty. The Ski Races sponsored by SoFi started around 10:30am. It was a mixed bag of skill levels to say the least, from a few borderline-Olympic level skiers to teams of costume-clad party seekers...like these fun people! At the bottom of the race was a beer tent loaded with Lagunitas, another fine sponsor of the Tuck Winter Carnival. I especially liked this part of the race as I got to catch up with a few trip leaders of groups SkiSync traveled this past year! This is also where the SkiSync crew accepted entries into our annual Vacay Giveaway sweepstakes, in which we partnered up with Keystone ski resort. Side Note: In our history as a group ski travel agency, we've held a lot of sweepstakes. BUT, only at events hosted by MBA programs will B-schoolers enter the sweepstakes and then proceed to negotiate ways to win. From old fashioned beer bribery to deligitimizing other entrants of the sweepstakes on various legal grounds, it's always a blast! Not long after the race, beer tent festivities and lunch was the Hot Dog Eating Contest. If you've ever seen a hot dog eating contest before, you know it's messy business and often only turns out well for the winner...sometimes. One member from each school entered the contest in order to win the title and an awesome trophy. Nobody lost their lunch and it was still totally entertaining. This event sponsored by Lagunitas was only open to racers at the event, so the SkiSync team didn't attend. We'll assume there were beers and hugs. 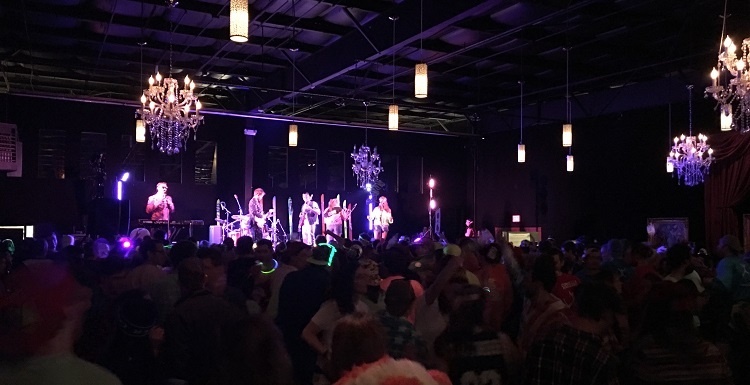 The Closing Ceremony held at the Mountain Meadows event center had all the elements required for a killer ski weekend finale. From Tuck's 80's cover band (which was really good, btw) to shuffleboard to beer pong, it had it all. This is also where Tuck Winter Carnival Co-Chair, Chris Govey, did a stellar job announcing the winner of SkiSync's TWC Keystone Vaycay Giveaway, Chris LeRoy from MIT Sloan! We got a chance to congratulate Chris LeRoy after he discovered he won a 4 day vacation to Keystone, CO. Not only was he one of the most surprised winners we've ever had, he was also one of the nicest. Always glad to see free ski vacations go to good people! From our perspective, the 2017 Tuck Winter Carnival was enormous success. Some of the most defining features of this success being the quality of the events, the ever-present sense of comradery between schools, and well-orchestrated event execution by the TWC Co-Chairs. Even the weather was perfect, with bluebird days, great snow and temperatures that were almost t-shirt worthy. 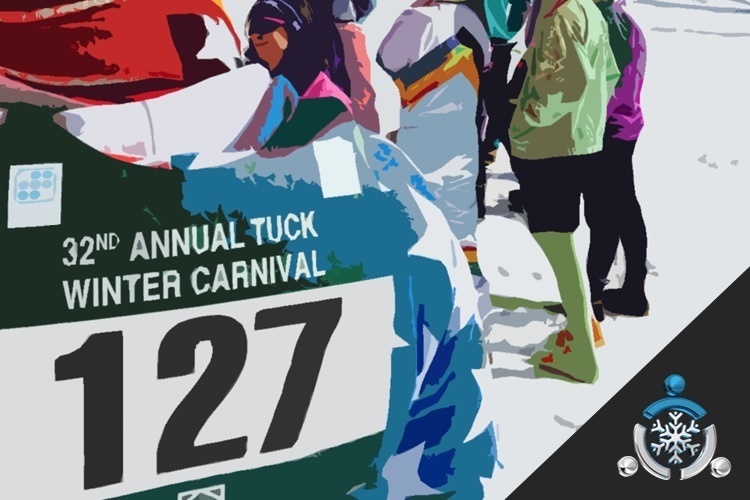 From what I understand, the Tuck Winter Carnival is an exclusive event for MBA programs only. And while I can't say how to go about getting invited to the TWC (sponsors aren't privvy to that sort of thing), I can definitely say that ski club members from MBA programs everywhere should at least try to get involved with this truly unique event. Have a group of fellow ski enthusiasts? or learn more about our group ski packages.